WOW, 2014 is already coming to an end. Can’t even believe the amount of things that happened to me this year, some bad, some good, I decided to make a wall of text. This was been a great year for my game dev objectives. In January I got Quest of Dungeons approved on Steam in only 6 days, which was mind blowing, on March 25th I finally got it released, and during the rest of the year several other platforms got a port, like Linux and Android, both platforms that I never had worked before, so I learned a lot. Finally on October I got QoD approved for Xbox One. 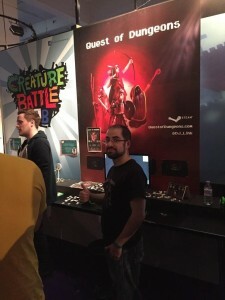 I was lucky enough to be at EGX 2014 in London, I loved it, this was my first time on such an event and I was amazed by everything, even more because I got to meet so many cool people, and other developers who I’ve been following their work for years. Also I created a new brand for my indie games, called Upfall Studios, in order to give it a more professional look. Not everything is good and this year I got a glimpse of what happens when you push yourself for years, I’ve been making games for quite some time now, switching between working on them full time or splitting with a day job (gotta pay rent), around February I collapsed, ended up in the hospital and had to take a 2 week sick leave, it was not pretty. So resolution for next year, taking care of myself better, work less but more efficiently. It was kind of a weird year in gaming for me, I skipped the Wii completely (last generation was the Xbox 360) but for this generation I got the WiiU, which I love btw, and I started having that nostalgia feeling and playing older games, in fact I spent Christmas playing Super Mario World and Mario RPG on my SNES. OMG GO SEE INTERSTELLAR RIGHT NOW!! I have to idea what 2015 holds but I’m looking forward to it, the plans so far are to finish the Xbox One port and start working on the next project.